Babalwa Brook: San Diego from New Jersey via New York City! San Diego from New Jersey via New York City! Great! Just great! How am I going to get my money now? Should I get off the bus, wait for her to get back to the stop with my check? Did she have it with her? I didn’t have her number? I overheard her telling Avon, she was going to go back to the facility after dropping me off. I called the new girl. She didn’t pick up, c’mon, pick up! Pick up! Pick up! She did! I told her to ask the lady if she had my pay check. I called boss, no answer. He’s a lawyer, he was probably in court. Oh man! What am I going to do. I sent boss a text. He called back immediately telling me they would deposit the check into my account. I believed him. I wasn’t at the bus long, and we drove off! Good bye New Jersey! See you around! I didn’t know what was awaiting me ahead, but I was looking forward to it. I told Perry, I was on my way. He told me he was glad I called, he had overslept. Perry is his own boss, he works from his house office. He never uses the alarm, he wakes up whenever he feels like it. I stayed in touch with him throughout the day. He was up and about trying to make sure everything was in order before I arrived. This is the same guy who told me he needed to get a shovel and start cleaning up the house, two weeks prior. It was a joke, but I don’t know how much of it was based on the truth. East Coast is 3 hours ahead of the West coast timezone-wise. It must have been around 11am when I arrived at the airport. My flight was at 4pm. I had ample time to kill. I bought some snacks and sat at the waiting room. Watched some housewives episode (Beverly hills, if you care to know J) I had saved on my PC when I had internet. I was falling asleep due to my busy night the night before. Time flew and before I knew it, it was time to go. I headed for the gate, checked in and AMERICAN AIRLINES KNOWS WHY YOU FLY! (In my best Ellen de Generes Voice). I sat next to a nice young man who had his hoodie on the entire flight, I have no idea what he looks like. Good thing is, neither does he. I must have fallen asleep as soon as I sat down. I was so tired! It had been a crazy few days. I hope I didn’t snore or fart! The flight was about 7 or 8 hours long. Perry had warned me that there might be fog and we might have to land in Los Angeles (instead of San Diego) and he might have to pick me up there, or they would arrange a hotel for us and have us fly to SD the next morning. I was open to whatever. 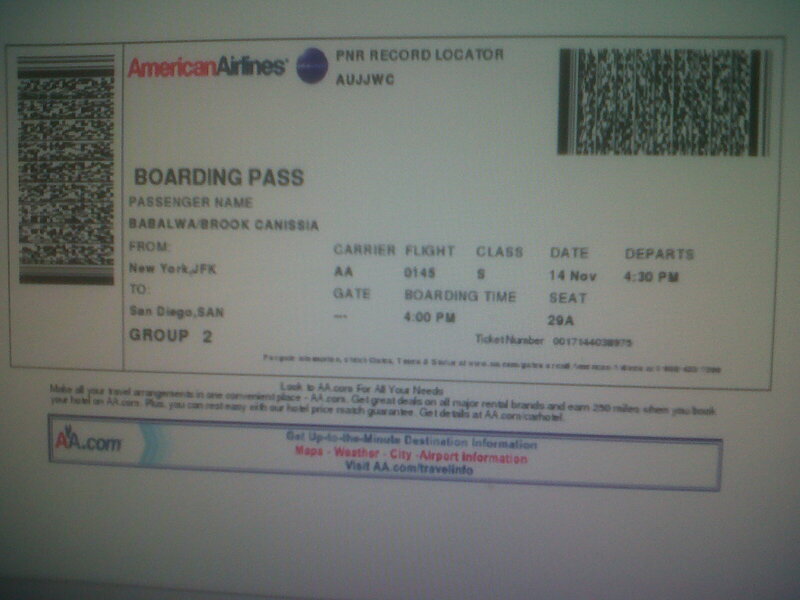 That would’ve given me an opportunity to see Los Angeles, be in LAX which I have always wanted to see. Don’t get me wrong, I was looking forward to meeting Perry, I was just keeping an open mind. Don’t judge me, I’m just a girl from Uitenhage, exploring America! No fog, we made to San Diego on schedule. It was around 11pm Eastern time when I arrived and 8pm San Diego time so to speak (Pacific Time). As I got off the plane, it dawned on me, I was no longer in New Jersey. Nobody but my family and two friends new where I was. WHAT THE HECK WAS I DOING! I ran to the restroom to freshen up and then turned my phone on. Perry had been waiting for me outside. OH MY GOSH, this is really happening! I hope he’s going to be nice to me! I walked out, called him and told him where I was waiting for him. He drove around to pick me up. I had the hugest smile on my face, you could swear I was just released from prison. Well, I was! I’m in California baby, wHOOOOooooo! I could yell at the top of my voice! There he was! Perry, he looked so handsome in person! Dear Lord, I’m going to live with this man! What is happening right now? He got off the car, “Brook?” Perry! Hi! WE did the awkward hug/handshake thing most people who meet for the first time do. I didn’t care, I was glad he was handsome. Call me Shallow, call me anything, as long as you call me. Maybe? He had a bunch of red roses in the car for me. EIGHTEEN! Count them! The biggest bunch of roses I ever got! And I have received flowers in my time! I think I remember the first thing I ever said to him was, “I’m here!” His eyes looked more beautiful in person, they are nice and green. He says they are hazel. We drove through the city of San Diego, he showed me around. It was beautiful, there’s part of town called the Gas Lamp, it’s kinda like 7th Street, Melville (where my sister was lucky enough to live for a couple of years), Florida Road in Durban or Long Street in Cape Town. We drove past the bay, etc. We grabbed dinner and took it home with us. I had already seen pictures of the house online and he had sent me a few of the inside. It looked much nicer in person. It was very brown though, everything inside was brown. We sat on the sofa, had dinner, and talked, then bedtime!